Cove Guardians’ propaganda that Taiji dolphin meats are disguised as whale meats in Japan. Cove Guardians lie again and again on their Facebook. It’s one evident case. It can be a crime: damage to credit and obstruction of business. Taiji dolphin meat continues to be sold and sometimes labeled as whale meat in local supermarkets and tourist shops. We can confirm that shipments of whale meat have been delivered to one processing facility from Norway during the months of Nov-Jan. whether this meat is labeled coming from Taiji or if this “Taiji Whale Meat” is actually dolphin is unknown. Cove Guardians must know that Taiji dolphin fishery legally fish also some kinds of small “whales” out of International Whaling Commission’s administration. We can see Chapter 45 of the Fisheries Research Agency‘s report in 2013. Its Sheet 1 shows Wakayama Prefecture’s catch quota and its fishery’s catch numbers from 2002-2012. Ma-gondou(マゴンドウ, “マゴンドウ鯨” = ma-gondou kujira in Image 2) is a subspecies of short-finned pilot whales and their catch number in 2012 is 36(quota) + 184 = 220. And oki-gondou(オキゴンドウ, oki-gondou kujira) are false killer whales and their catch number in 2012 is 20(quota) + 70 = 90. We can confirm that shipments of whale meat have been delivered to one processing facility from Norway during the months of Nov-Jan. whether this meat is labeled coming from Taiji or if this “Taiji Whale Meat” is actually dolphin is unknown. is nonsense as refutation in that sense. The Specified Commercial Transactions presentation of 太地漁協スーパー(Taji Fishery Cooperative Supermarket) says that they fish gondou kujira(ゴンドウクジラ) and that the meats of minke whales and of sei whales are from our research whaling. ● About the meats of minke whale and of sei whales, where are they gotten? ● As you know, for IWC carried the moratorium of commercial whaling in 1982, Japan has temporarily stopped commercial whaling from March, 1988. But we supply the meals of minke whales and of sei whales from Japanese government’s research whaling for their resource survey in Antarctic Ocean and so on. And in Taiji, for the protection of our long time culture including food and so on, , on the coast, we catch gondou kujira being out of IWC’s regulation, in the seasons and in the quotas that our government decides with the resource survey. 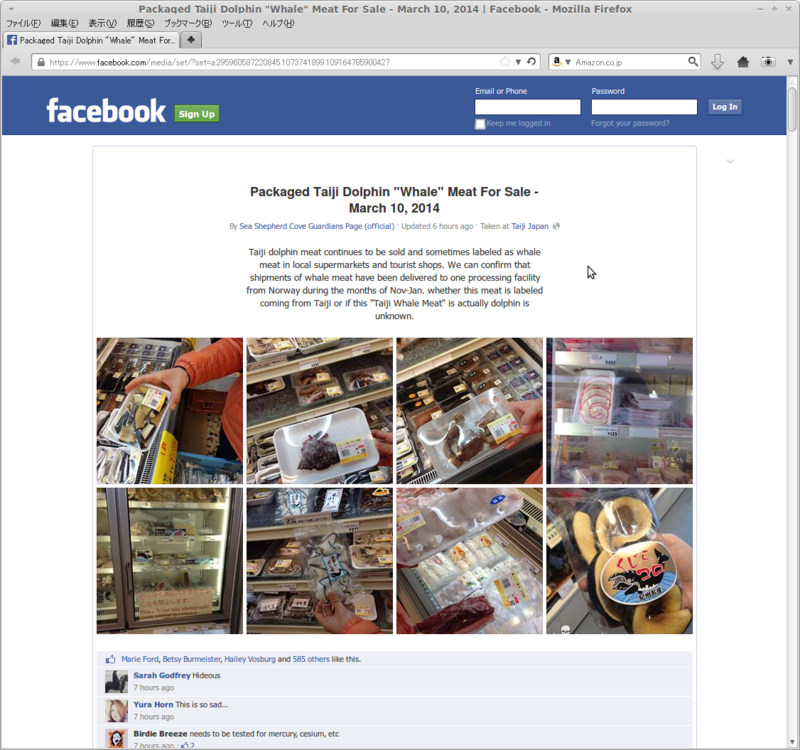 Thus we, Taiji Fishery Cooperative Supermarket sell whales landed at Taiji Fishing port both by store and by mail. First of all, dolphins and porpoises are small tooth whales. So dolphin meals are whale meals. No problem that some species that we call dolphins or porpoises are called kujira(whales). It’s very basic knowledge of cetology that we can learn in the books for kids. So image 4,5,6, and 8 aren’t disguised. Notice that those pictures show rather only brands and not the nutritional facts labels. Do their labels say that those meats are of whales that Taiji fishery doesn’t hunt? If the Cove Guardians didn’t lie, why they show the label of マゴンドウ鯨(short-finned pilot whales) in Image 2 as disguised? Or do they say that they didn’t know such a basic knowledge of cetology or even what Taiji’s whaling industry hunt? So it’s a propaganda. * They took those pictures of the supermarket without permissions. Taking pictures without permissions itself is trespass. It’s very common that our shops and so on require permissions to take pictures. But anti-whaling people don’t try to know. 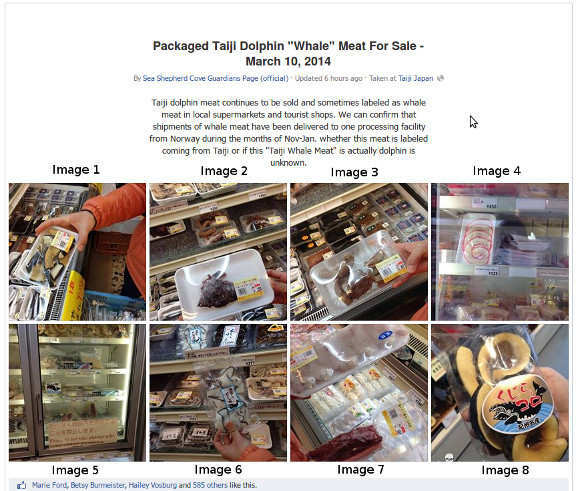 Posted on March 14, 2014 June 20, 2017 Categories OpinionsTags dolphin freak, sea shepherd, taiji, whales, whalingLeave a comment on Cove Guardians’ propaganda that Taiji dolphin meats are disguised as whale meats in Japan.